Have everything in place for move day but the muscle? Let us give you the stress-free move you deserve. Call now to book your free onsite consultation! Do you need help loading your Uhaul, Penske, or Budget rental truck? Would you like a hand loading an ABF or Old Dominion trailer? We’re happy to provide professional moving labor at an affordable rate. You’ll be in good hands with our experienced crews. They are very knowledgeable when it comes to properly loading and securing your shipment so that it reaches your destination safely. We do have a little advice when it comes to renting a moving truck. The most important thing you’ll need to think about are how are my items going to be protected? 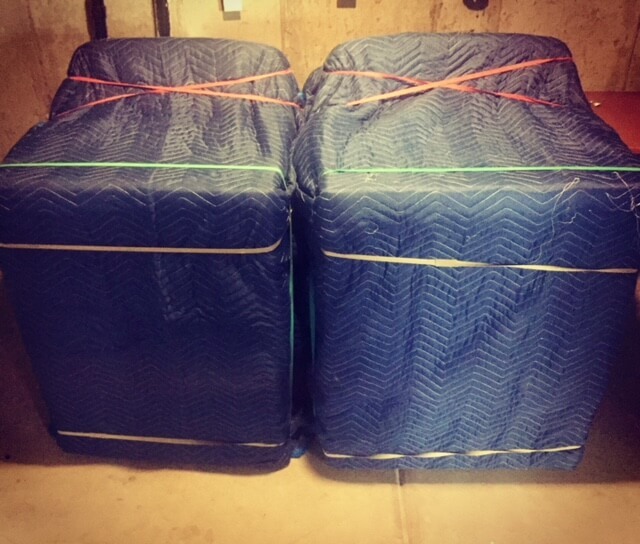 People are often surprised to learn that we carry between 80 and 120 moving pads on our trucks to protect your belongings. Our guys wrap almost everything before it leaves the house. We’re not saying you necessarily have to rent this many moving blankets for your move as the cost can add up quickly, but you probably need more than you think. Every truck rental company provides a pad rental service. They’re generally priced about the same and are about the same quality. We’re also happy to sell you moving pads if you want some extra protection. We can provide the tape to hold your moving blankets on at no cost extra cost. We will also shrink wrap your couches for free as well. When it comes to choosing a rental company, there are a couple things you should look at. In general, Uhaul is usually the better choice for regional moves. They’re usually a bit on the cheaper side and their trucks are easy to drive. Also, Uhaul can sometimes be more convenient to return since they have many more locations than Penske and Budget. If you’re going over 1000 miles, Penske or Budget is usually the better option. Penske and Budget trucks usually have diesel engines, so the fuel savings can be significant on longer distance trips. Penske trucks are usually a more comfortable ride because a majority of their trucks have air ride driver’s seats (Uhaul did recently roll out new Ford trucks that are very comfortable, but they’re still gas engines). Also, most of Penske’s 26-foot trucks are air-ride equipped. If you’re going a long distance, this can be very beneficial. Air-ride makes for a smooth ride for your belongings, whereas the spring suspensions on other trucks can be a bit bumpy. If you’re traveling with a lot of glass or fragile items air-ride should be one of your main considerations. Congratulations! You’ve made a good choice in moving to Cheyenne. We know you’ll love it here just as much as we do. We’d be happy to be one of the first faces you see. Our professional crews can have your rental truck or trailer unloaded for you in no time at all. We’ll bring all of our own equipment, so don’t worry about renting any dollies or anything of that nature. We will come with everything we need, and then some. We’ll make sure your new home is completely protected. We’ll start with putting a pad over the front door to protect it from bumps and scrapes as we come in the door. We’ll also put a door-jamb cover over your door jamb so that it also remains scratch free. We’ll make a path for our dollies through the high traffic areas of your home with neoprene floor runners. If you have carpeted stairs that will receive lots of traffic, we’ll make sure we have some carpet shield down to protect them. If your house has hardwood floors, we’ll lay down some masonite hardboard to make sure we don’t scratch them up with our equipment. We can set up your beds, put together your dining room table, and perform many other types of furniture assembly. We can even bring in your pianos and safes. It doesn’t matter if you need help unloading your pickup truck or a 53’ semi, we have the versatility and experience to get the job done efficiently and safely. Call/text today or simply book your help online!